Create A Career+Life That Works For YOU. showing up as a leader. Laso serves women in IT across diverse industries like healthcare, financial services, manufacturing, supply chain, retail, professional services — from $1 million to global Fortune 500 companies. Your sense of belonging is one of the most powerful feelings in the world. Belonging aligns with feeling balanced, happy, respected and rewarded. An online, 7-day program that equips you to elevate your career. Get all the career tools — plus a powerful community of women who believe in you. An exclusive, VIP job search with IT career advancement expert Laurie Swanson. Strategic and measurable with accountability milestones to accelerate your career. Get clear about your career options and next steps with expert Laurie Swanson as she councils you on your options and next steps. Equal work. Equal pay. Equal benefits. Equal opportunity. The world of technology has long been male-dominated – a challenging environment for ambitious women. No matter your field, we serve women in tech across many industries: healthcare, financial services, manufacturing, supply chain, retail, professional services — from $1 million to global Fortune 500 companies. Women make up only 24% of computer-related tech workers. 32% of women in SET (Science, Engineering, Technology) feel like they are “stalled” in their careers and will like likely leave them. Bias causes U.S. women in tech to leave the tech field at a 45% higher rate than men. In one survey only 27% cited family as a primary reason for leaving tech. 1% of women in tech are Hispanic and 3% are Black/African American. For women in tech under age 25, earnings on average are 29% less than male counterparts. 63% of the time, men were offered higher salaries than women for the same role at the same company. Women in tech ask for less pay 66% of the time, and will often ask for 6% less salary than male counterparts. 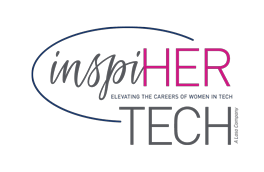 InspiHER Tech focuses on women in tech because gender parity, transparency, and inclusiveness are must-haves, not nice-to-haves. It’s time to level the playing field. That’s why. You are our why.